See the target; Hit the target… Sounds easy enough, right? Throwing a baseball is just a matter of having a catch. You have done it thousands of times… in the backyard, at picnics, during practice, warming up before a baseball game and between innings. Despite being a relatively easy task, some players complicate the matter. Instead of the simple process of “see the target, hit the target.” there are many other thoughts that get thrown in the mix and interfere with the process. Thinking about velocity or mechanics or even fears about the result of the throw increase the chances of an off-target throw or the throwing yips. This over-thinking process is problematic and at the heart of the yips. 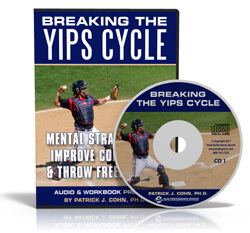 The throwing yips are a mental block that interferes with the ability to throw a ball accurately and efficiently. The yips occur when a player overthinks how to throw to a target, analyzes what they are doing while they are doing it and worrying or fearing where the ball will land. 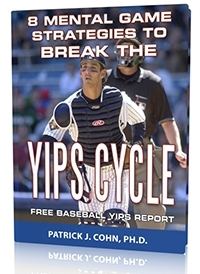 A player with the yips has such a significant degree of mental interference that several physical things can happen: the body tightens up, the arm angle changes, the release point varies from throw to throw or the player double-clutches the ball. A player with the throwing yips will mentally image a bad throw slightly before they make the throw. A player with the yips often becomes so self-conscious of their inability to make accurate throws that they try to control every aspect of the throw, making matters worse and further embedding the yips within the mind of the player. Hagerty threw 94 miles an hour as a junior in college and was selected with the 32nd pick in the first round of the 2002 draft by the Chicago Cubs and gave him more than $1 million to sign. Things were looking up for Hagerty as he had a promising MLB career in front of him. In his initial season with Class A Boise Hawks, Hagerty struck out 50 with an ERA of 1.13 ERA in 48 innings. As he prepped to step up to the major league level, Hagerty tore the ulnar collateral ligament in his pitching elbow which required Tommy John surgery. Hagerty missed over a year of ball and then it happened… Out of nowhere, Hagerty couldn’t find home plate and so, his battle with the yips began. In 2005 at Class A Boise, Hagerty threw 6.2 innings and allowed 23 earned runs, hit 4 batters and threw 9 wild pitches. After the 2008 season, Hagerty walked away from baseball. Hagerty compared the yips to suddenly losing the ability to write your name. After a 10 year-plus layoff, Hagerty is making a comeback and signed a contract with the team that originally drafted him, the Chicago Cubs. Hagerty has already upped his fastball to 96.9 mph. This time around, Hagerty isn’t focusing on the yips. Instead, Hagerty is focused on his approach and being aggressive when pitching. 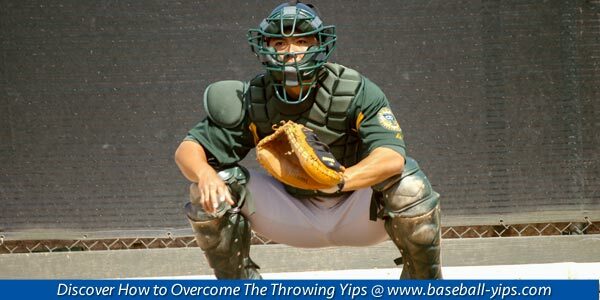 The throwing yips is all about fearing bad outcomes while successful pitching is a matter of focusing on your approach to each hitter and executing a good throw. Let go of the outcome, focus on the process, and trust your intuitive throw. This simple phrase can remind you to stop overthinking and re-focus your attention on your approach to each hitter. Remember that your fear of a bad throw–and what that means to you–drives the over thinking and over control. You have to let go of what others MIGHT think so you can keep it simple in the moment of execution. Get Expert Mental Game Coaching for Yips!